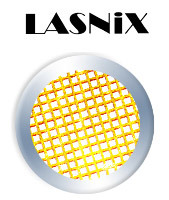 LASNIX offers unique infrared components: free-standing metal grids to control power and polarization. LASNIX components are substrate-free. They do not deviate or offset the beam, and withstand high power. Fixed steps of broadband infrared attenuation allow precision power setting of a laser beam. Application fields are beam quality control, nonlinear studies, detector calibration, and heterodyne systems. The broadband infrared filter allows precision power attenuation of a laser beam. Applications fields are beam quality control, nonlinear studies, detector calibration, and heterodyne systems. The infrared polarizer filter allows low-loss, extremely-high-contrast analysis and control of a laser beam polarization. Applications are in polarimetry and ellipsometry. Two LASNIX linear polarizers in series allow to continuously control the transmitted laser beam power, and independently set its polarization orientation. Application fields are spectroscopy, polarimetry, nonlinear studies, detector calibration, and heterodyne systems. A field-portable combination of a rotating polarizer and a fast power sensor allows a quick assessment of ellipticity and orientation of an infrared beam's polarization. Applications are in beam quality control, polarimetry, ellipsometry, and especially in circularity control of CO2 laser cutting machines. Record fast power sensing of infrared beams up to 50 W, useful for laboratory and OEM monitoring, or for fast feedback stabilization. A permanently aligned, lamellar-mirror FT spectrometer of minimal footprint, for monitoring infrared beam spectra over a record broad spectral region 1 - 70 µm, with reduced response even including the VIS and THz regions.